OM VISA Consultancy - Global Immigration, Students, Visitor, Business & Work VISA Consultants: Why Immigrate to canada and other questions by OM INTERNATIONAL...!!! 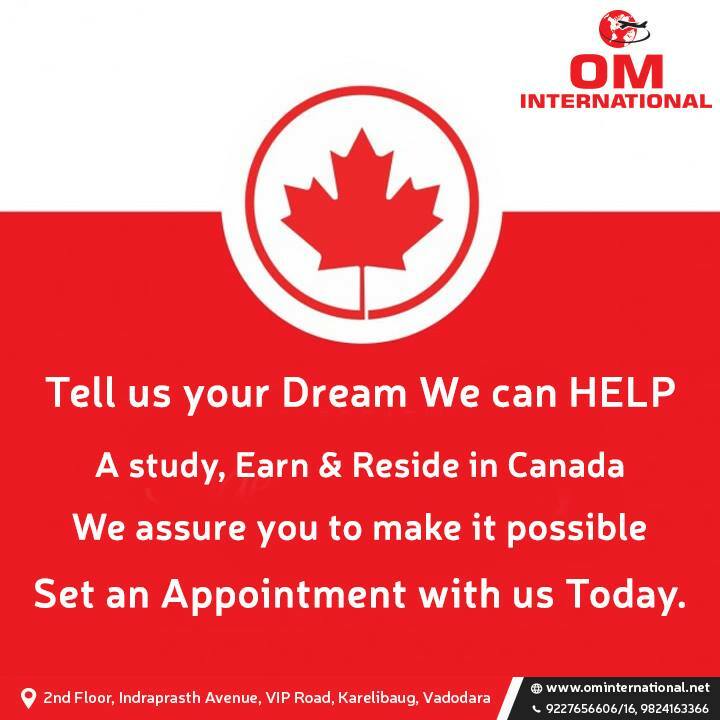 Why Immigrate to canada and other questions by OM INTERNATIONAL...!!! OM INTERNATIONAL Overseas consultant was conceptualized formed and has commenced with the sole premise to assist the clients who dream of settling abroad to realize their 'Immigration Dreams’. The Team at OM INTERNATIONAL comprises of professionals with in-depth expertise and enormous experience having provided total comprehensive and complete end-to-end immigration solutions to our clients we provide dedicated and timely service to our clients. OM INTERNATIONAL Registered as Company is the most plausible and experienced immigration and visa consultants in India. OM INTERNATIONAL Visa consultant have large client base satisfied customers, who are happy with our services, And offers various services to our clients with dedication and strength of mind in the process of immigration visa and other assistance. 1. Why should you think about immigration to Canada? Face it! You get up every day morning with the sound of the alarm clock dreading the day ahead. Office is a challenge in itself, but before that you have to deal with the morning traffic, not to mention the pollution and the smog. At the end of the day you are tired to think but you have to face the long travel back home through more traffic. Sounds familiar? Well this is the story of most of us. Moreover in spite of all the daily drudgery we cannot expect much difference in our daily lifestyle. But what if I told you a new and better way of life is possible through immigration to Canada. 2. Immigration to Canada? Isn’t that too expensive? That’s the question that is asked most often by people who are convinced about moving to Canada but are afraid of the costs. The surprising thing is that most people who ask this question would not mind putting double or even triple that amount on a new car or a new apartment. Moreover when you opt for Immigration to Canada, you will be earning back your original investment within a year of earning abroad on account of the exchange rate. 3. What about my family if I immigrate? Canada has a family friendly policy and you will be allowed to take your family with you when you successfully get a visa to live in the country. Your spouse can even take a job and work while you are in the country. Which means that both of you can earn at the same time and save more money at the higher exchange rate. 4. Won’t I miss my country if I immigrate? This is another question that is asked by most people who are contemplating the idea of a better life, but are unwilling to leave their country or families behind. One answer to this is to take a work permit to a new country Canada and experience life there for a few years. If you are happy with your life in the Canada then you can opt to apply for permanent residence, else you can always choose to come back to your own country. 5. Isn’t the immigration process too complicated? Yes, the process can be very complicated and confusing for the uninitiated but at OM INTERNATIONAL education and immigration consultant we pride ourselves on making it simpler and hassle free for you. Our expert Immigration consultants are well versed with the nuances of immigration and can assist you in the process. To know more you can walk in for a free consultation at any of our branches across India.